With the passthrough sketch you can send AT commands (NB-IoT) to the ublox module on the ubee. Follow the steps on the Mbili or Autonomo support pages to install the required board files. This example doesn’t require any additional libraries. Simply plug the bee into your Mbili or Autonomo and upload the example code. * The UBEE will work on every board with a (x)bee pinout. * The Mbili does not wok with the R4 module, it can't handle the fast baudrate. // The R4XX module has an on/off pin. // You can toggle this pin or keep it low to switch on the module. Note: The Mbili can not handle the high baudrate of the R4 module. Search for Sodaq_nbIOT or Sodaq_3Gbee(2G/GPRS and 3G) depending on your module. Click on the bar to show the install button and install the library. Click on File > Examples > [library name] to see more example codes. 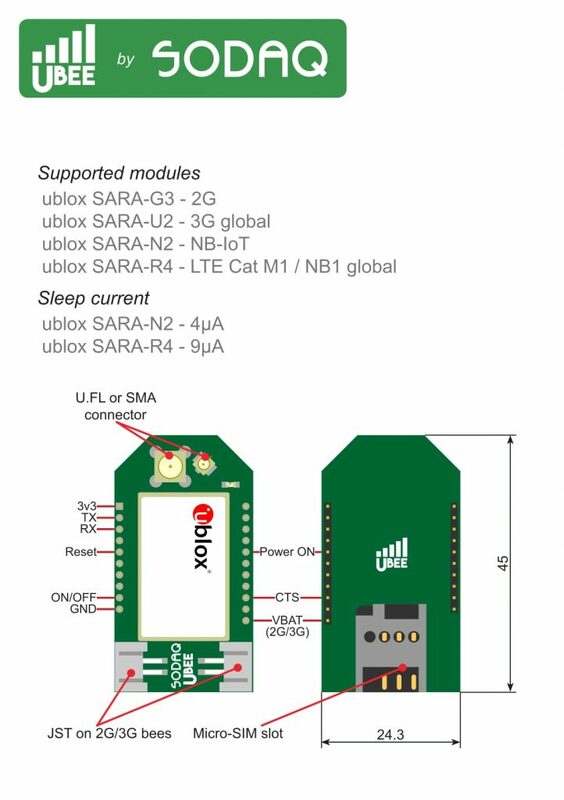 Ubees with SARA N2 modules can be updated through the serial interface. Note: You need a board who can handle the 115200 baudrate. Ubees with SARA R4 modules can be updated with soldering an usb cable to the usb pins and turning the module on. All other Ubees shouldn’t require an firmware update.